A new venue for our 5th annual SETTFest brought with it a much larger crowd and more tomatoes for everyone to try out! 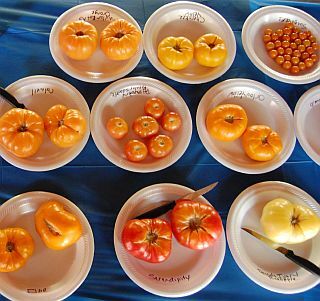 We lost count at 70 people in attendance, and also saw a welcome increase in the number of tomatoes brought by different people, which gave us the unique opportunity to compare the same varieties grown in different gardens. Our mission is to introduce heirloom tomatoes to Central and South Texas gardeners and farmers alike, dispel the myths that only ‘heat setter’ varieties can be grown here, and offer advice and seeds wherever we can. So it was great to see folks asking lots of questions (including a few stumpers! ), gathering seeds, and talking shop. View photos of the 2011 SETTFest!